Health experts have warned homeowners to take measures to stop "huge numbers" of rats flushed out by floods from re-establishing themselves. The Chartered Institute of Environmental Health (CIEH) said people clearing up after the heavy rain should block up holes and clear up waste food. 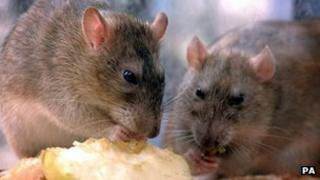 Rats washed out of sewers are infesting homes amid more daytime sightings. The pest-control industry estimates the number of call-outs to rat-catchers in flood-hit areas is up by a quarter. CIEH director Julie Barratt said: "We know huge numbers have been washed out... where sewers have flooded, and there have been a lot of rat casualties. "When people are cleaning up, block up holes and don't leave food lying around." She said rats were intelligent, adaptable creatures able to replenish their numbers very quickly, and on the lookout to exploit new opportunities. "It's really important people remember when throwing food out, to try to keep it out of the way of pest species," she said. "The more we can do to keep them dislodged and on the hoof, the better it will be." The CIEH has also warned local councils against cutting pest control services to save cash, saying too many treated pest control as a "treatment response" rather than as a potential public health threat. The National Pest Technicians Association (NPTA) said rat sightings have risen as the washed-out, nocturnal rodents emerge in the daytime, but that does not mean total numbers have increased. NPTA vice-chairman Adam Hawley told the BBC: "We're having an incredible summer of rain, and the sewers and drains are not coping with the amount of flood water that inevitably flushes the rats to higher ground. "With that, rats are trying to find some sort of dwelling to live in - whether they then try to move into people's garages or sheds, or into people's lofts to get away from the flood water. "The knock-on effect is, potentially, that people's dwellings are getting rat infestations." He said the heavy rain had led to more daytime sightings, but despite the public's perception, that did not mean the population had increased. The NPTA represents 900 pest control companies and conducts an annual rodent survey, the last of which was published a couple of months ago before the recent deluge. Mr Hawley said he expected the number of call-outs dealing with rats in flood-hit regions such as Devon to have risen by around 25%. Brown rats are one of the planet's most serious mammalian pests, ruining crops and harbouring disease. Expert jumpers, climbers and swimmers, a single pair can multiply to 200 within a year. A spokesman for Rentokil, Britain's biggest pest-control company, said it has seen a "small increase" in call-outs, but added that most of its work is for business rather than consumers. He said he believed the rat population was generally growing, blaming the greater availability of food - from takeaway wrappers and leftover rubbish - coupled with generally milder winters, which helps breeding.